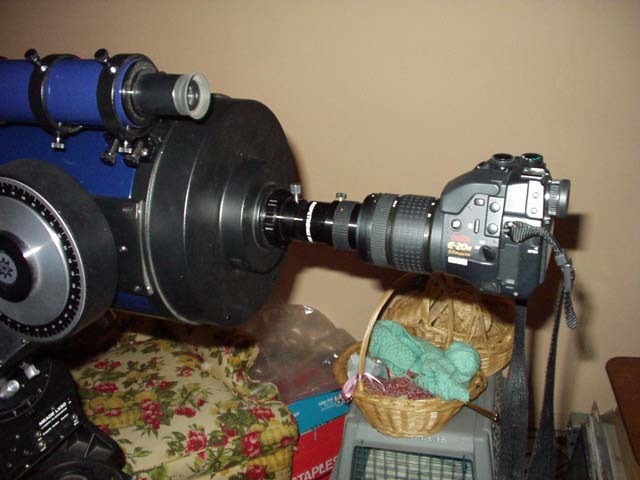 Here's how the Scopetronix MaxView 40 camera/digital camera/video camera telescope adapter works. Essentially, its a 40mm eyepiece with integrated sliding tube mechanism and T-threads. 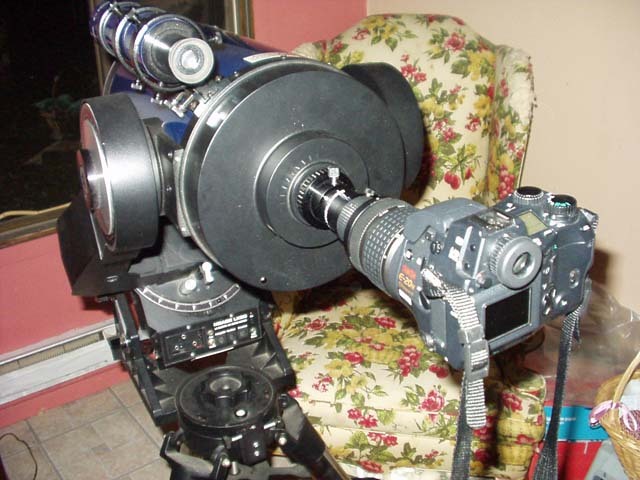 This allows for eyepiece projection astrophotography with anything you can get a T-adapter for. 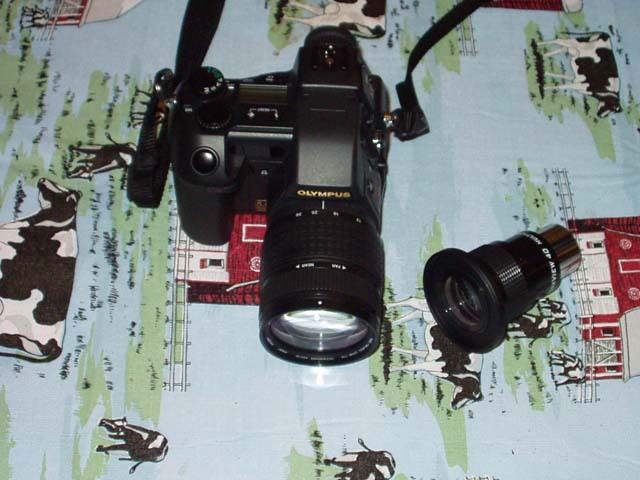 Olympus E20 camera with ScopeTronix MaxView 40 and 63mm adapter ring. Here's how the assembly looks when you thread the MaxView 40 onto the camera. This is what the contraption looks like when you've got it mounted to the telescope. Yes, the camera is being supported solely by its filter threads. 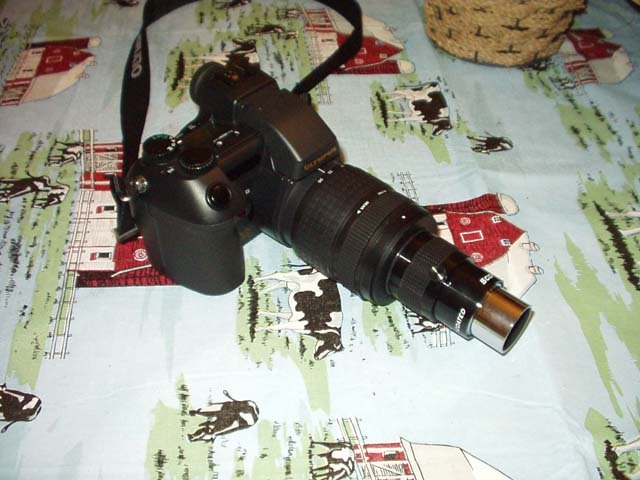 While this is a simple and inexpensive solution to the problem of astrophotography with digital cameras and camcorders, it's certainly not ideal in this configuration. In the least, it would be wise to wrap the camera strap around the finderscope mount to keep the camera from crashing to the ground. I'm thinking about possible ways to take the weight off of the filter threads and support the camera some other way. next clear night, I'm going to point this contraption at Saturn, Jupiter, and whatever else may be around- we'll see how it looks then.